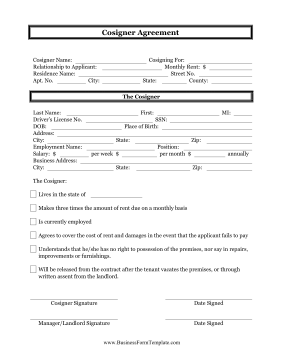 This free, printable cosigner agreement is great for students and other tenants of rental units and apartments who cannot cover the cost of first and last month's rent on their own. Parents and guardians can take over the additional costs. Understands that he/she has no right to possession of the premises, nor say in repairs, improvements or furnishings. Will be released from the contract after the tenant vacates the premises, or through written assent from the landlord.